So are those Howell melons the only oval ones? In our area there are round ones but the oval are the sweetest. Yes ! they are ever so yummy and sweet ! 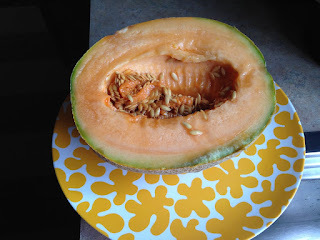 I grew up in Dexter and am still in the area and as far back as I can remember you'd never had a melon unless it was a Howell melon !! How are your baby (not so baby) lambs doing ?